As a nonprofit fundraiser, you know the value of individual donations and grants, but another source of income to consider is a corporate sponsorship. Many nonprofits have effectively leveraged corporate sponsorships to increase revenue and develop relationships with well-heeled prospects. In this post, we will examine some common assumptions about corporate sponsorships for nonprofits as well as the value and risks that these relationships carry. Sort of, but there’s more to it. A sponsorship payment is one where the corporation contributes to an organization without substantial gain in return. Legitimate corporate sponsorships provide tax benefits to the business, help fund the nonprofit, and avoid classification as unrelated business income (which is subject to taxation). To maintain these benefits without compromising the tax-status of the contribution, the nonprofit needs to avoid “advertising” for the business in return for the contribution. Sponsors can be recognized by the organization, but this recognition must not endorse the sponsor’s product, use comparative language, or mention price information. Once you cross into advertising for the sponsor, the contribution becomes taxable income. If you’re interested in getting more info on this subject, check out this online presentation. Check out the full infographic to learn more about how to get corporate sponsors. A nonprofit sponsorship may seem unattainable for smaller organizations, but the continued emphasis on corporate giving and the wide variety of businesses willing to become sponsors makes it feasible at any level. Local businesses may be looking for ways to increase their visibility and public awareness and larger businesses often seek to soften an austere image by working with charities. Before approaching potential sponsors, think about the demographics of your community and which businesses would like to reach this audience. Your best bet is to seek out sponsors whose business relates to your cause. For example, it makes sense for a pet food company to sponsor a community animal shelter. Once you’ve identified a list of prospects, whether through alignment with your cause or personal contacts, you will need to spend some time thinking about the value proposition for the businesses you will approach. What is their incentive for giving? One attractive option to explore is pitching businesses on sponsoring “matching donation” periods during your next peer-to-peer fundraising campaign. This allows you to maximize the impact of the sponsor’s gift (by providing further incentive to individual donors) and it helps expose the sponsor’s brand to potential consumers (using Classy’s donation matching feature you can automatically display a sponsor’s logo whenever a gift is matched). There’s no question about it, a poor partnership can damage an organization’s image and diminish public support. The American Academy of Family Physicians was criticized in 2010 for partnering with Coca-Cola. The relationship come under scrutiny because of the conflict between the AAFP’s mission and the perception of soda as contributing to obesity. Controversies like these affirm the importance of finding a compatible sponsor. Ask yourself if there are conflicts between your organization’s and the sponsor’s values and mission. It’s also a good idea to do some research on the sponsor’s reputation or past charitable gifts. On the other hand, research has shown that nonprofits are seen as less competent than for-profit businesses. The right sponsorship could lend an aura of enhanced credibility to a lesser-known organization. Of course, you can forego the risk of aligning your nonprofit with another brand by simply focusing on other sources of income. But there are additional benefits to a corporate sponsorship that may be worth the risk. One of the most important results of a partnership is that both parties reach new audiences. You can bet that businesses will want people to know about their philanthropy and greater visibility can lead to new donors and volunteers, both from the public and the sponsor’s employees. Ultimately, the choice is yours, but it’s one worth thinking about. 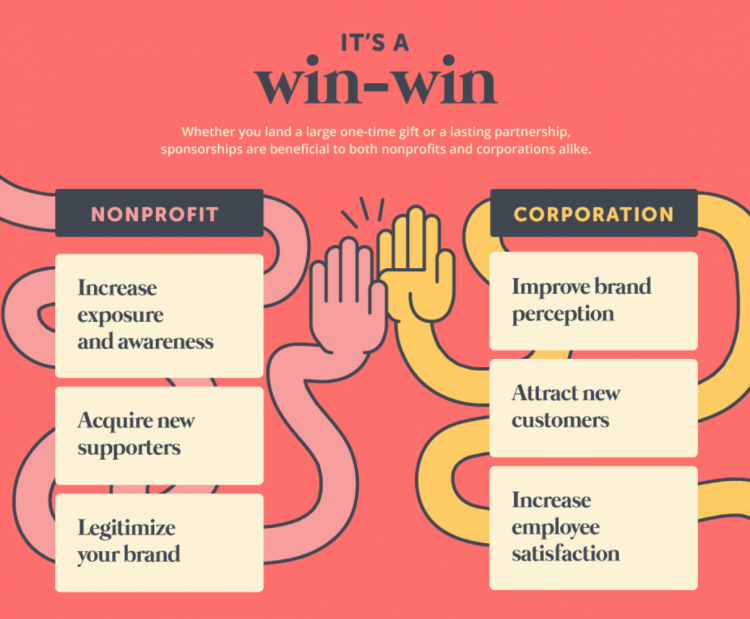 If you can develop the right relationships to secure corporate sponsorships for your nonprofit the rewards can be significant.